Call Cossentino and Sons to get started! Choosing to add a sunroom to your home in Columbia, Maryland is a smart move. Not only will you reap the benefits of each East Coast season, but you will also add value to your property. A sunroom may be an addition, but there are numerous details to consider throughout the planning process. Call Cossentino and Sons to get started, and learn more about our process. At Cossentino and Sons, we understand just how important your home is to you. That’s why we start every project with a visit to your home. Once our professionals determine the scope of the project, an experienced contractor will provide an accurate and honest proposal. The consultation is the perfect time to discuss the dreams you have for your new addition. Once the finer details of the project are established, our architect will begin the design process. Our team will work closely with you and your family to ensure that your unique needs are met. We recommend that you come to this meeting prepared and with an idea of what you would like and not like in regards to your new addition. If you would prefer the hands-off approach, our designers can provide you with examples and inspiration. We know that the construction process can interrupt your day-to-day life, which is why we plan a detailed schedule to complete your new sunroom on time. Our team works professionally and respectfully, cleaning up the site as we go. We are happy to maintain an open line of communication during the construction phase, in case of any questions or concerns that may arise. Whether you plan to grow old in Columbia, Maryland or sell your home down the line, you can enjoy your new sunroom for years to come. A sunroom provides the best of both worlds, especially during the hot Maryland summers and blustery winters. 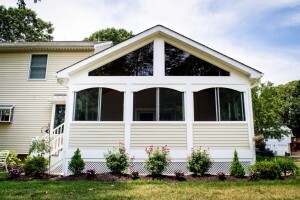 Are you ready to relax, entertain, and enjoy time with your family in a new sunroom? Call Cossentino and Sons. This entry was posted on Thursday, July 12th, 2018	at 9:01 am	and is filed under Screened Porches and Sunrooms	. You can follow any responses to this entry through the RSS 2.0	feed. Both comments and pings are currently closed.